That stipulation is, it'll beat either the 360 or the PS3 versions of the game, but not both, the Nintendo boss Reggie FIls-Aime told Gametrailers TV. Still, that's a hell of a Pepsi challenge. 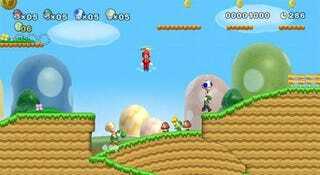 Granted, New Super Mario Bros. Wii only releases on a single platform. Modern Warfare 2 is still expected to be an enormous seller for both Xbox 360 and PS3, take your pick. Fils-Aime is unfazed by that and sticks to his claim. "Absolutely. I say that unequivocally," he told GTTV. "Now, you've got to give me the entire holiday selling season. Right? So let's take it all the way through the January NPD data. Yes. I'll put that stake in the ground." Or maybe he means it'll outsell Modern Warfare: Reflex on the Wii?